The Labour Party candidate in the Ekiti State governorship election, Hon. 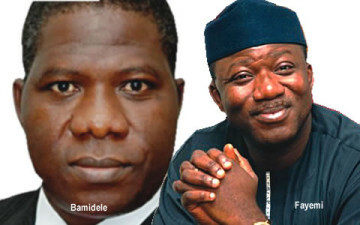 Opeyemi Bamidele, has cautioned the outgoing Governor, Dr. Kayode Fayemi, to stop blaming his defeat to the Peoples Democratic Party (PDP) candidate, Mr. Ayodele Fayose, on his refusal to distribute money and bags of rice to the electorate. According to him, â€œstomach infrastructureâ€ theory advanced by the governorâ€™s camp can send a wrong signal about Ekiti people to the outside world. Bamidele, in a statement by his Media Aide, Ahmed Salami, in Ado Ekiti on Sunday, said the theory was unfounded as it did not influence the choice of the electorate, which voted against Fayemi. The lawmaker, who came a distant third in the election, recalled that before going to the polls, Fayemi distributed over 200 buses among different interest groups while his wife, Erelu Bisi, distributed buses, sewing machines and several other equipment to market women. He, rather, attributed the incumbent governorâ€™s defeat to Fayose to some self-serving intellectuals and politicians, who misled Fayemi. Bamidele, who is Chairman, House of Representatives Committee on Legislative Budget and Research, added that the poll remained the best conducted by the Independent National Electoral Commission in recent time, although not absolutely devoid of hitches.